Wednesday Silicon Flatirons sponsored its latest presentation in the Center’s Policymaker Series. Retired Rear Admiral James Arden Barnett, Chief of Public Safety and Homeland Security Bureau FCC, outlined his bureau’s role in specifying public safety interoperability requirements in the National Broadband Policy that we anxiously await for release next February. The Chief shared with the audience that the FCC will be drafting interoperability requirements for public safety broadband networks, and that they are considering several models of which to build and fund these networks. Adm. Barnett expressed his desire for openness but he did not stay long for questions or provide the audience with any contact information to his team. My impression is that this is the same openness we are seeing from other parts of this administration. Politics aside, there are two themes that were prevalent during the reception after the talk: lack of local public safety and industry input and the belief that the best option to create this network was through Federal government funding. In the Chief’s defense, he was going to visit Intrado in the afternoon. During his talk, he rattled off a list of government agencies that he planned on consulting for drafting the interoperability requirements, but not once did he mention the TIA, IEEE, IETF, or other industry standards bodies. Our industry has a long successful history in creating interoperability standards from the SONET Interoperability Forum to the WiFi Forum, Metro Ethernet Forum, etc. These organizations are comprised of all stakeholders in the process especially the ones developing the technology. Noticeably absent from the process was first responders. They are the eventual customers of this process and need to state their needs. Each organization and locality has different needs, and the standards need to remain flexible enough to account for them which leads me to my next point. Public Safety networks are typically funded and built locally and regionally. They are not something built from Washington. I applaud the FCC acting as a catalyst for creating interoperability requirements, but they cannot dictate technology and products. The one size fits all approach will not work in a country as diverse as ours. Adm. Barnett hinted at specifying LTE as a technology for building broadband public safety networks. The FCC should focus on application layer interoperability issues and not specific transport layer technologies. The resiliency of the network will come from the diversity of transport technologies utilized. Also, he had the belief that commercial networks may not be as reliable as dedicated government run networks. May I remind the Chief that it was the Nextel iDEN network that held up the best during the 9/11 attack, and that our national defense plan relies on commercial networks during time of emergency. A great example for a interoperable broadband public safety network is in NYC. DOITT has done an excellent job utilizing private and commercial facilities to build a IT infrastructure for the city. I recommend that the bureau spend more time with this organization to learn how they built their network, and use it as a model where other cities may follow. Without industry input, I am afraid that this 10-20 page addition to the National Broadband Policy will be another vague government edict that will not get us any further than when this idea originated 8 years ago. If this is an area of interest for you and your company, I suggest contacting the bureau directly and provide your comments. A month ago Comcast upgraded my head-end for DOCSIS 3.0. I had some backwards compatibility problems so Comcast gave me a new DOCSIS 3.0 cable modem. My problems went away and my bandwidth increased dramatically. I must say that I am getting quite use to the extra bandwidth. Windows 7 download in only a few minutes, and I enjoy the quicker upload speeds for posting pictures and blog posts. The 3 Mbit/s upload is pretty consistent in my neighborhood. The only time I wish I had more upstream bandwidth is when I am moving large PowerPoint files or synchronizing to the cloud. Having this much bandwidth exposes two deficiencies. The first deficiency is that my home network can now be a bottleneck. I have one 10 Mbit/s device, 2-100 Mbit/s device, a 1 GigE device with a 802.11g/n network. My machine-to-machine transfer rate tops out at 20 Mbit/s. The second deficiency is latency. It takes 27 ms to go round-trip to local Comcast servers. The latency to some of the SBC approaches 100 ms which introduces echo into my VoIP calls. I can fix the first problem by buying a new Ethernet swtich and more GigE devices. After all it is only money. The second problem is not something that I can fix because after all this is a best-effort service. 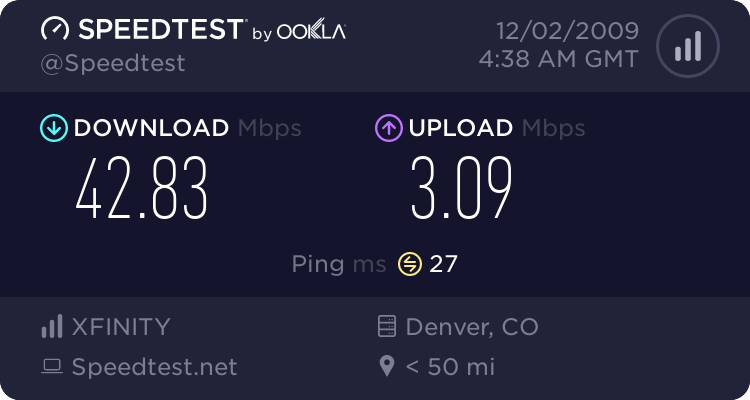 I am delighted that all of the computers and game consoles in the house has enough bandwidth to do what they want, but our phone calls still suffer from echo. I would really like to see Comcast offer different classes of service for their High Speed Internet.